Adapted from the popular board trivia games, the Scene It? game series debuts on the Wii in this follow-up to Box Office Smash (available only on Xbox 360). 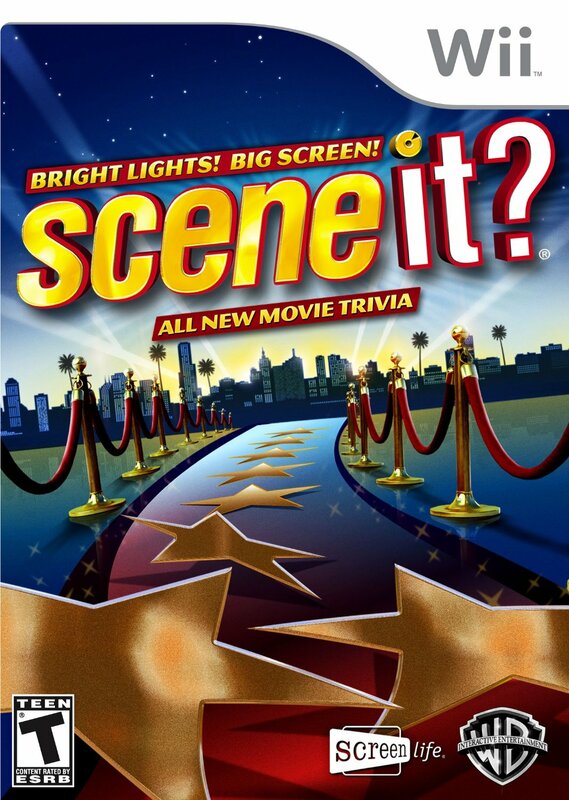 Trivia questions cover popular movies and blockbusters ranging from the 1970s to current 2009 cinematic offerings. Developers give equal time to all movie studios within the immense 2,800-plus question cache. The sustainable content has a simple interface revolving around each player’s avatar (up to four players allowed) and a host. The host’s lip-synching lags with the audio a bit, but the font size offends more. It’s hard enough trying to answer quickly for maximum points, so squinting your eyes (on a normal TV) hurts the performance even more. Unless you have a large, widescreen television, plan on scooching a chair very close to the screen. The 12 new, yet stereotypical avatar types (starlet, leading man, horror queen, etc.) match the movie themes well. In-depth customization options or Mii incorporation would be nice here, but developers mainly keep avatars in a small view until the results cut scenes at the end of each round. Players test their movie knowledge through three rounds then a fourth “final cut” round, which puts the pressure on the leader to answer correctly or give up valuable ground to rivals. This game also tests listening, visual and analytical skills while giving players several chances to catch the leader. The current low scoring player chooses the game types. Options allow for negative points, silencing the host and star bonuses, which reward an additional 50% multiplier for each correct answer when players select their color in a sliding bar mini game. When players accidentally, or purposely, choose another player color, then that player gets the multiplier bonus. The long play option increases each round from three puzzles each to five. The controls only require the remote while developers use animations to prompt users to shake the remote at special times. Puzzle types include the classic anagrams, movie clips and sound clips plus some new ones like sketches where players scratch off the pictures with the remote and Pixel Flix, which has great retro video game style recreations of famous film. Many times it’s more appealing to watch the full scene than answer the question. The cut scenes feature robots and other movie themed events to boost the excitement among rounds. Actual movie clips might have done better, but the animation probably saves some production money. Essential for movie fans with a high replay experience which overshadows the small font issue. Gamers can also find Scene It? free online or a timely Scene It? Twilight release on the Wii. Scene It? Bright Lights! Big Screen! is rated T (Teen) by the ESRB for drug reference, mild blood, mild language, mild violence and sexual themes. This game can also be found on PS3 and Xbox 360, which are compatible with the standard console controllers, BUZZ! Buzzers and Microsoft’s Big Button controllers. This entry was posted in Video Game Reviews and tagged Film, Michael Siebenaler, Mike Siebenaler, movie, Scene It, Tall Writer, trivia, video games. Bookmark the permalink.